The types of hammers that I have found most useful for carpentry work are the trim hammer, framing hammer, and sledge hammer (shown above). A hammer is just about the first tool that you buy as a carpenter. If you take good care of your hammers they will last a very long time. For this reason, it is best to purchase the right one the first time. This way you're not wasting money and time buying more hammers than you will ever need. There are few types of framing hammers to consider before you make your purchase. 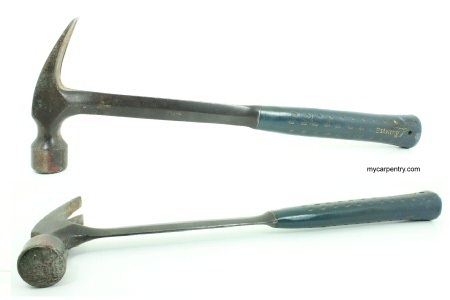 A framing hammer typically has a longer handle and generally weighs between 22 and 32 ounces. The extra weight and length make it ideal for getting the leverage you need when pulling a bent framing nail, or the power you need to drive a joist or rafter over to its layout mark. Framing hammers have handles made of wood, fiberglass and metal. They typically have a milled face (sometimes referred to as a "waffled" face) to give the hammer a better grip on the nail head. This feature also makes it a terrible hammer for trim work. If the hammer slips off of the nail, or your aim is off, the waffled head will make a nasty ding (called "pecker tracks") on your trim work. 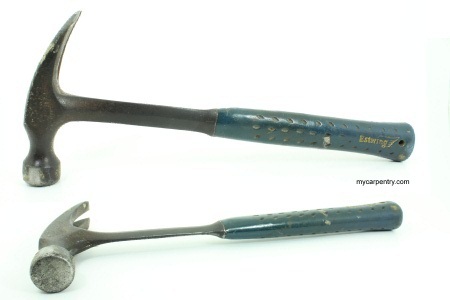 I own an Estwing 22 ounce steel handle framing hammer with a waffled face (the actual one is shown above). I have owned it for over twenty five years, and it is still going strong (although, the waffled head could use some re-milling). My 20 ounce ripping hammer has a smooth face and makes a nice finish/trim hammer. It is also a little shorter and is a couple of ounces lighter than my framing hammer. The smooth face makes it an ideal tool for nailing deck surface boards and deck railing. The shorter handle and lighter weight also makes it a little easier to handle when greater precision is needed. You can perform most home building tasks with these two types of hammers. I also own a large mallet and a sledge hammer for persuading framed walls or beams over to their desired position, when a 22 ounce framing hammer won't do the trick. As mentioned earlier, there are several types of hammers. Some carpenter's that I have worked with prefer the 28 - 32 ounce hammers for framing. The size is interesting, but the weight is not practical for my taste. After a long day on the job site, swinging a 32 ounce hammer can get quite heavy. I have never regretted or found a better hammer combination than the two Estwing hammers I own. I went through a couple of wooden handled framing hammers in my early days as a carpenter. I've often heard that they absorb shock better than their steel-shanked cousins, although I've never noticed the difference. Perhaps it is because Estwing built the shock absorption into the grip. The bottom line comes down to preference. I've known carpenters that swear by the fiberglass hammers that they own, carpenters that defend the comfort of a hickory handled hammer, and those like me who prefer the durability of a steel handled hammer.